'Mine no Yuki' Erect growing bushy shrub with glossy dark green leaves. 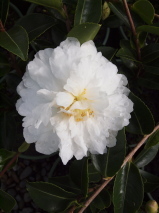 Through the winter and spring the bush is covered with pure white peony type flowers . Lovely as a standard or hedge as clips well. Hardy. Prefers a sheltered site with good soil, though will tolerate dry conditions. Grows in sun or shade / Prefers a semi-shaded site / Will tolerate very hard frosts.